Selected, recently uploaded pictures. To see more of the same, click on the gallery name under the keywords. 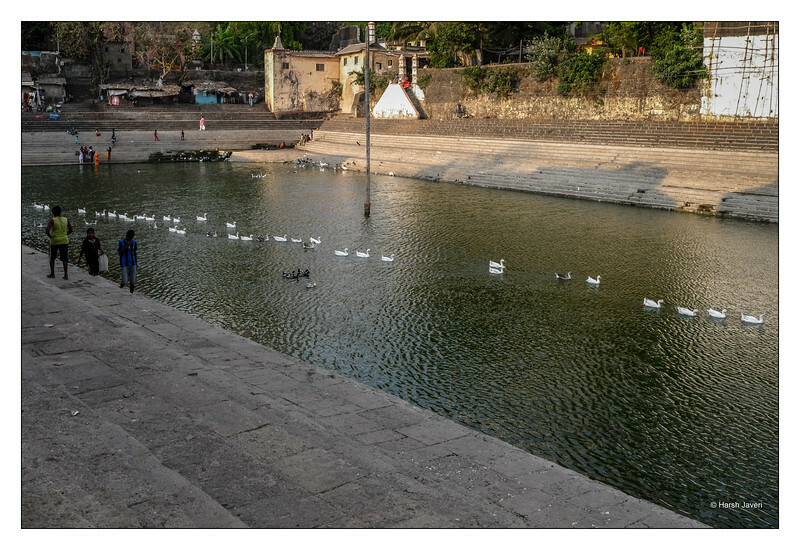 Banganga is an ancient water tank in South Mumbai. According to local legend, it sprang forth when the Hindu god Ram, the exiled hero of the epic Ramayana, stopped at the spot five thousand years ago in search of his kidnapped wife Sita. As the legend goes, overcome with fatigue and thirst, Rama asked his brother Lakshmana to bring him some water. Laxman instantly shot an arrow into the ground, and water gushed forth from the ground, creating a tributary of the Ganges, which flows over a thousand miles away, hence its name, Banganga, the 'Ganga' created out on a 'Baan' (Arrow). The tank today is a rectangular pool structure surrounded by steps on all four sides. At the entrance are two pillars in which oil lamps called diyas were lit in ancient times. The tank is spring fed and so its water remains sweet, despite being located only a few dozen meters away from the sea. The shot is wonderful is so many ways. Of course the diagonal row of geese draws the eye, but I love the overall sense of place and scale , and the late afternoon light. Such a beautiful history and nice place. Love the white ducks! What interesting information Harsh, I love legends like this. The tank has a parade of ducks on it. Great shot! Thank you for your constructive comment. Very fascinating and interesting legend about how this place got the name of Banganga. Nice work, Harsh. Nice shot and info! This reminds me of Barton Springs in Austin, TX. Love the ducks swimming across the water!